This design classic from Artemide is the result of an intellectual revolution. A revolution called Artemide Tizio 50, a creation that did not reject tried and tested solutions but one that newly established all important structural and design features. Thus, a type (in Italian: Tizio) of light was released that up to now has lost none of its fascinating appeal. The Artemide Tizio 50 is the expression of perfect balance in the true sense of the word: the wide-reaching arm of this table lamp is held in a floating position by a counterbalance located above a filigree rotary axis. The oscillation creates the visual impression that the forces are being held in balance – an element that adds lightness and dynamics to the geometric rigour of the composition. The history of origins of the Artemide Tizio is based on a simple idea: Richard Sapper, the designer who created this table lamp in 1972, preferred working with the light directly illuminating his working surface and the rest of the room being hardly illuminated at all since this way it was easier for him to concentrate on his work. He wanted to create a light with a large working radius that still needs little space. He achieved this in an impressive way by means of this light that he created for Artemide. This evergreen which seems to have been left untouched by the passing years additionally impresses by its elegant surface finish and the high-quality workmanship which makes this table lamp is a long-standing, loyal companion. The Tizio 50 is a creation by the German designer Richard Sapper who is based in Italy whose guiding principle "form follows function" can also be well seen in the composition of this desk lamp. His product designs, for instance, for well-known automobile manufacturers and computer companies are considered as trend-setting and also received multiple awards. 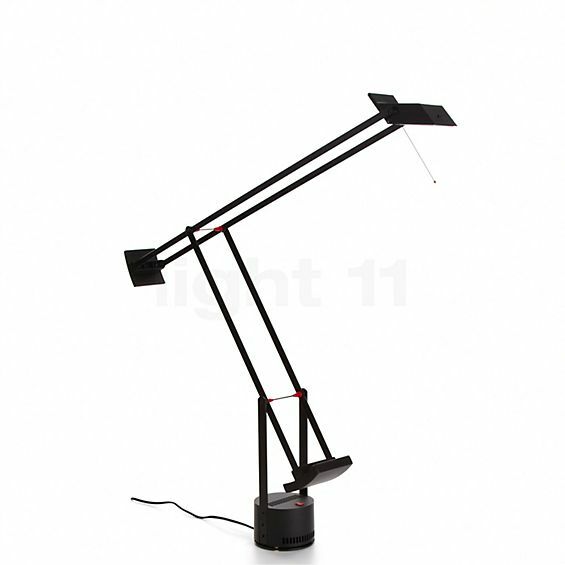 The design of the Tizio 50 was penned by Richard Sapper who created the Desk lamps in 1972 for the manufacturer Artemide. The low-voltage technology makes the Tizio more efficient and more durable. Thanks to the refined arrangement of the counterweights, the Tizio represents weightless dynamics. By means of the stick-shaped handle, the light head of the Tizio can be aligned as required. The innovation lies in the design: a transformer installed in the base of the Tizio 50 table lamp converts the mains voltage of this light fixture from 230 V to 12 V and feeds a halogen lamp. The power is supplied via the light arms so that no cables are needed. The harmonious balance of the proportions is functionally upgraded by the clear, direct light of the Tizio table lamp that supplies needs-oriented zone lighting – the arms, the light head and the counterbalances of this design classic can be aligned. 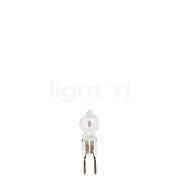 The use of modern low-voltage technology additionally makes this table lamp an energy-saving light source that is characterised by low power consumption. Sometimes a person needs something that he actually does not need. You do not really need the TIZIO 50. A light from the hardware store would do the trick. But some people expect more than just light from a lamp. Those who click on this review were certainly already ""infected"" by the TIZIO beforehand and do not need any additional product information. They know the ""object of desire"" already and the only obstacle to purchasing it is the sinfully expensive price. The fact that this classic is in the ""Museum of Modern Art"" in New York only increases the ""desire."" I simply had to have the TIZIO! That was 18 years ago! It is still standing on my desk. The desk is now a new one, but the ""lamp"" is still the old one! A couple of weeks ago, I purchased a second TIZIO for my living room. 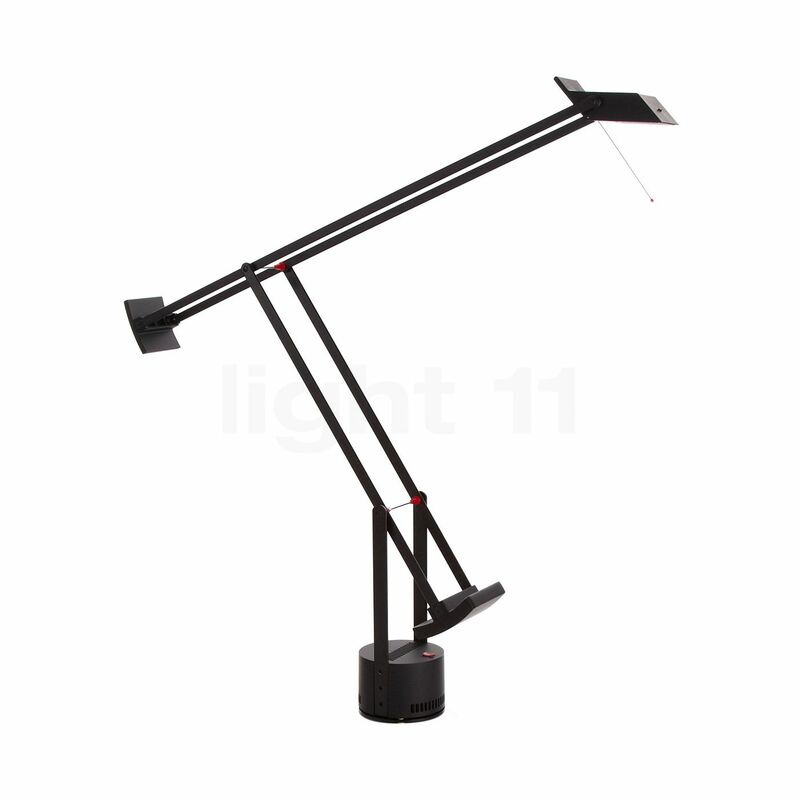 I do not have to say anything more here about the exceptional design, the unique versatility of the ""lamp"" with its two arms and counterweights or about the tiltable luminaire head. Also the fact that the power is transformed in the base and no briquette-shaped transformer is hanging from the end of the line is well known. Every ""TIZIO infected"" person also knows that the light intensity can be regulated and that the ""desk lamp"" can be easily changed to a ""room light"" or a ""uplight"" - and that with the TIZIO you are acquiring a classic of the high-tech language of forms, which was awarded with the famous ""Compasso d'Oro"" award. However, I would like to explicitly mention the reliability of this ""light object."" Except for changing the bulb, I have never had a problem with the TIZIO in all those years. It will outlive me and one day I will hand down a piece of ""design history"" to my children. People often buy ""cheap"" things, that later prove to be quite ""expensive"" due to their limited service life or their quickly outdated design. Given the ""perpetuity,"" this expensive purchase has proven worthwhile. Those who can afford the TIZIO 50 will understand why it is worth 5 stars to me. Prompt delivery. Uncomplicated return when I first ordered the wrong product. Excellent service and a very good price-performance ratio. A fantastic table lamp that can be continuously adjusted in all directions, it even has two lighting levels. I would buy it again. Tell other customers and us about your experiences with the Tizio 50 ! The benefits of the Artemide Tizio 50 make it the ideal choice for a desk in the home office. Here, it creates target-oriented lighting that prevents the eyes of the user from tiring too quickly. This way, dealing with different kinds of documents becomes much more pleasant. On a side table in the living room, this masterpiece from Artemide is able to make full use of its strengths by effectively illuminating a book, the newspaper or a magazine.